Sunday morning is bringing an unprecedented peril to Florida and much of the Southeast. As Hurricane Irma gets closer to population centers it’s size and strength are threatening both life and property. The most important thing now is for anyone who has not evacuated to find shelter and hope for the best. That said, there are still surprisingly asinine incidents popping up that make one question Darwin’s theory of natural selection. For instance, Rush Limbaugh broadcast a ludicrous and dangerous conspiracy theory. He said that warnings to evacuate were just a plot by television companies and convenience stores to increase ratings and sell more bottled water. Less than twenty-four hours later he fled his Palm Beach estate, leaving his listeners to the fate of Irma. “Florida authorities are advising people against firing weapons at Hurricane Irma following a Facebook event titled ‘Shoot At Hurricane Irma’ that garnered interest from over 45,000 accounts. 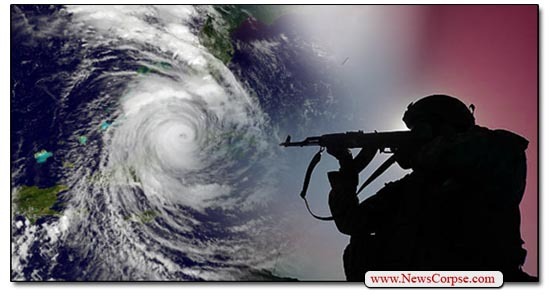 It may seem unnecessary to persuade people not to shoot at a hurricane. But we’re talking about people who think the Second Amendment permits them to take up arms against fellow Americans. And that includes those serving in the police and military that they sometimes praise as heroes. There are no shortage of stories about NRA members who shoot themselves or other innocents for frighteningly stupid reasons. And every Independence Day these cretins fire into the air despite warnings and news of tragic consequences. The Pasco Sheriff was correct to assume that a fair number of the thousands who joined the Facebook event might take it literally. Many people hold views that are no less absurd. There are those who believe that these hurricanes, and other natural disasters, are God’s punishment for homosexuality. And others are convinced that only the pagans will be swept away. This doesn’t even address all the mainstream Republicans who deny the effects of climate change and the science that predicted these massive weather events. That absence of reason can also infect gun owners who imagine that their bullets in large numbers will turn Irma around. In reality, it’s the bullets that can be turned around, and directly back toward the imbecile who fired it. The fact that a professional law enforcement officer finds it necessary to issue this warning is a sad statement on the state of our nation. But it’s better to make the warning than to regret the suffering after the fact.